Comfort, Privacy, and Panoramic Views at 7000 Feet! January and February weekends are taken, lots of week nights open--and lots of snow! Think Snow: March is wide open! Winter rates include use of my snowmobile, once there's enough snow to close the roads. (strictly for transportation to and from the house) Around a $200 value, and part of the adventure. You'll find the beds made on arrival. When you leave just pull back the covers on beds that were used. There's now a ROKU player attached to my rather "vintage" TV. Beautiful private home 7000 feet up in the High Sierras, 20 feet from the Stanislaus National Forest. Panoramic forest and mountain views to the South and East. Hiking and skiing trails right out the front door. Complete privacy and solitude. So many windows that you feel like you're outside when you're inside. Most quiet during the spring thaw, when 'The snow is melting into music.' (John Muir). Wildflowers abounding in July and August, during the annual classical music festival. Glorious warm days and blazing aspens in the Autumn. Winter brings the full California ski experience. Roads in the residential area are not plowed, so no cars are allowed to enter, and everything remains completely white. The snowmobile ride up from the village adds to the adventure! Road's end location is perfect for sledding. The two bedrooms, each with an adjoining full bath, are on the entry level. The master bedroom has a woodstove and panoramic views. It has a king-size bed and a twin. The smaller bedroom has a twin bed, and also a trundle bed which can be used as one or two twins. The whole second story is one large room, with a woodstove and windows all around. It has a half bath and futons for four. My husband and I really enjoyed our stay in your mountain home. The views were spectacular, and the house was very comfortable. We had a couple of days of great weather and one day to enjoy a rainy day by the fire. Neither of us had been to Bear Valley before, and we found lots to see and do. It must be beautiful there in the winter, and when all of the wild flowers are in bloom. We also enjoyed driving around the neighborhood and looking at the many beautiful homes. toilet, combination tub/shower, Mountain views! Master bath has great view of forest and mountains! The house is about a mile and a half above Bear Valley Village. There you will find a small General Store and a few shops and deli or restaurant services. Seasonal. There is a small man-made Bear Lake a mile or so from the house. Lake Alpine Resort is 4 miles east of the village. It has a great little restaurant. It's 10 miles to Mosquito Lake for good fishing. There are scenic creeks in the area, the large Mokelumne River canyon, and Union Reservoir. Panoramic mountain and forest views; spectacular sunrise and Alpenglow view; quiet and privacy--no houses or roads in view. One cordless, with extension downstairs. One antique! Answering machine. Keep your cell phones charged. Two wood stoves give the best, fastest heat. Electric floorboard heaters for back-up. House is very well insulated, and the low sun on the south-facing glass facade warms up the winter days. You'll find the beds made for you. When you leave just pull back the covers on beds that were used, so my housekeeper will know. Driveway accommodates at least two cars most of the year, with additional on-street parking. 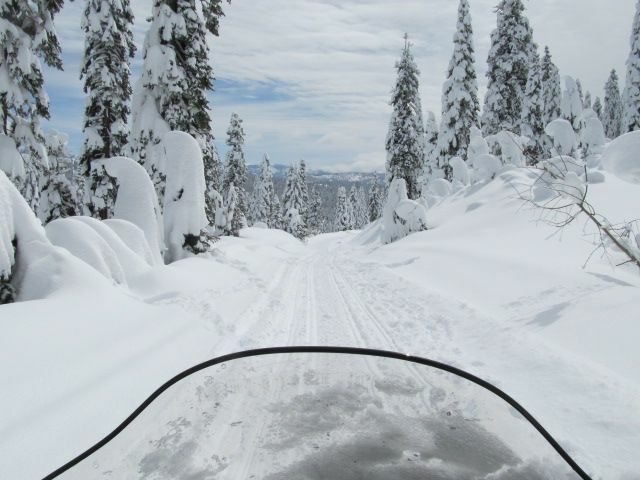 Complimentary use of Snowmobile for access provided in winter when residential roads close. The house has High Speed Internet service and WiFi. Towels and extra linens for the futons are stored in the Master Bedroom closet. The house has High Speed Internet service and WiFi. WiFi is also available in the village at the Bear Valley Library--even if it's closed, and in the comfortable Lobby of Bear Valley Lodge. Wood Stoves in living room and master bedroom are the fastest and most efficient way to heat the house; firewood is provided, as well as axes and hatchets for splitting kindling. The entire upper floor is one big Living-Dining-Kitchen area with an open feeling, panoramic views, and a half bath..
Jenn-Air C202. 4 burner electric. Separate electric oven. 10-cup Braun. Also deluxe grind and brew coffee maker with timer. Supplied with salt, pepper, some spices. Kitchen is especially well supplied for gourmet cooking and group dining. Deluxe coffee maker/grinder, large Crock Pot. Abundant cookware, serving pieces, dishes, cups, glasses, wine glasses. Kitchen sink with a view! And new hickory floors in kitchen and dining area. In addition to the dining table with 4 chairs and 2 extra padded stools, there is a breakfast bar with 3 high stools, which kids love. Also a couple of TV trays, and a bar stool for the cook! Rather "vintage" TV with ROKU player attached. Some DVDs, also a collection of "vintage" videos and a VCR! Lots of puzzles, board games, playing cards and poker chips provided. "Vintage" favorites and lots of kids' videos provided. DVD collection is growing. Not exactly, but the Stanislaus National Forest is 20 feet in front of the house, and a hiking trail with incredible views starts just to the right of the driveway. Sport shop rentals in Bear Valley village. Cross-country skiing right out the front door, Excellent sledding spots with sleds and saucers available. Hiking trails starting at the foot of the driveway, Our famous 'thirty-second hike' to unobstructed views of the Dardenelles that leads to an all-day trail continuing over the ridge to the ski area. Spring wildflowers surround the house. Wildflower hikes in all directions. Quiet and privacy, inspiring views. An excellent spot for human being as well as doing.